In November 2017, the California Air Resources Board (ARB) confirmed that all entities covered under California’s cap-and-trade scheme were compliant. Here we take a look at the use of California Carbon Offsets (CCOs) in companies’ paths to compliance, with a view to understanding what future CCO demand may look like. 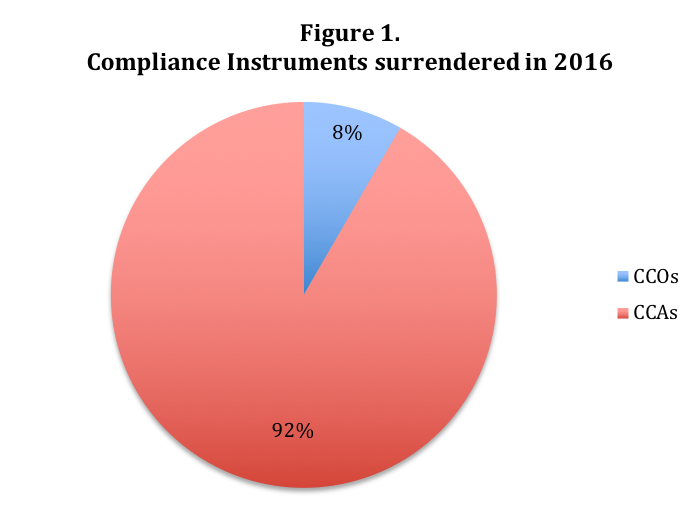 In 2016, 8.3% of instruments surrendered were CCOs (Figure 1). This compares to 7.9% in 2015. In 2016, 40 companies surrendered CCOs as part of their compliance obligation, compared to 52 companies in 2015. 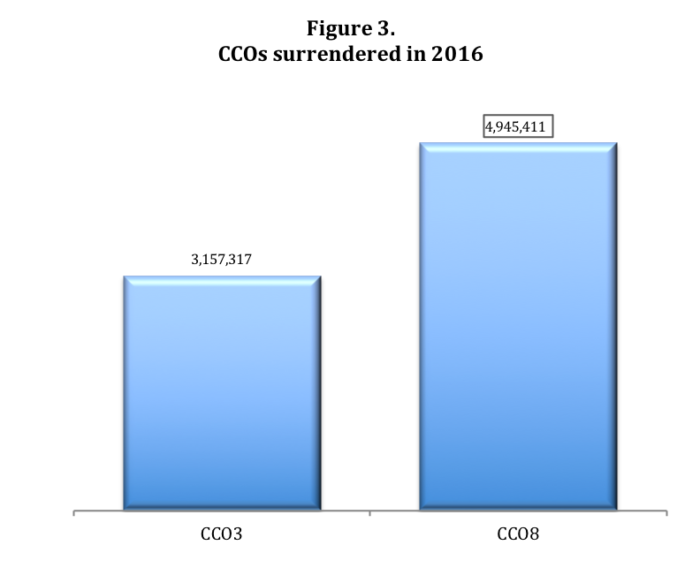 Despite fewer companies choosing CCOs in 2016, the number of CCOs surrendered rose from 8,089,542 to 8,102,728. The maximum amount of CCOs any company is permitted to use is equal to 8% of their total annual emissions obligation. 14 companies utilized their full quota in 2016, compared to 19 companies in 2015. 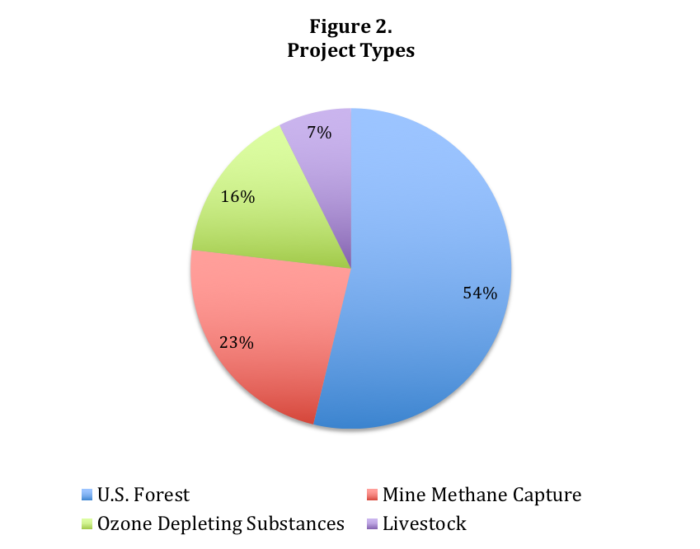 Figure 2 shows that over 50% of CCOs are attributed to U.S Forest projects – a trend consistent across previous compliance years. 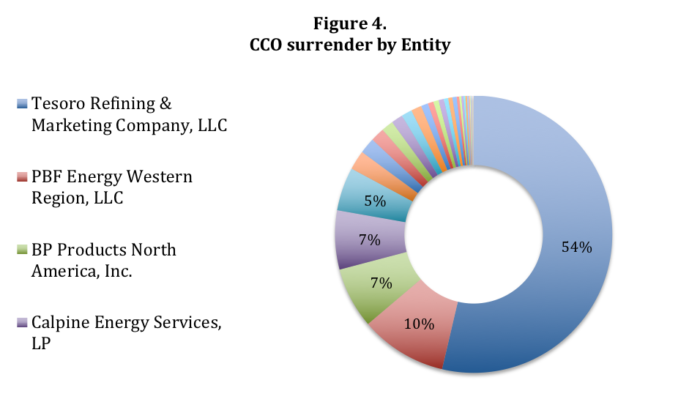 Of all CCOs surrendered, 61% were CCO8s (Figure 3). These are slightly cheaper than CCOs but carry a longer risk of invalidation. The distribution of CCOs is shown in Figure 4, with Tesoro Refining & Marketing Company LLC making up over 50% of total offset usage. Several other companies take up a larger share, after which the percentage shares become relatively small (less than 2%). Valero Marketing and Supply Company only utilized 30% of its maximum offset quota, whereas the other companies that make up more than 5% of total offset share utilized their full quota. Companies who have chosen not to utilize their full CCO quota for 2016, still retain the option to do so as part of their triennial offset obligation at the end of Compliance Period 2. In November 2018, companies must surrender compliance instruments to equal 70% of their 2015 obligation, 70% of their 2016 obligation and 100% of their 2017 obligation. 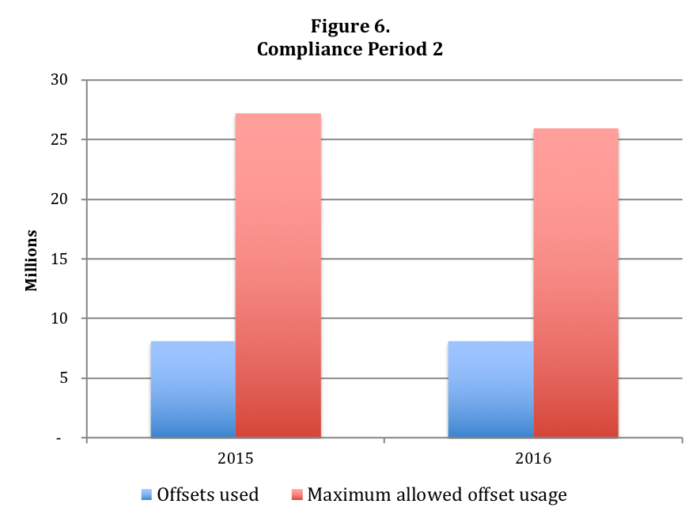 This unequal requirement for compliance instruments may have an interesting impact on the use of offsets to meet the 2017 obligation. 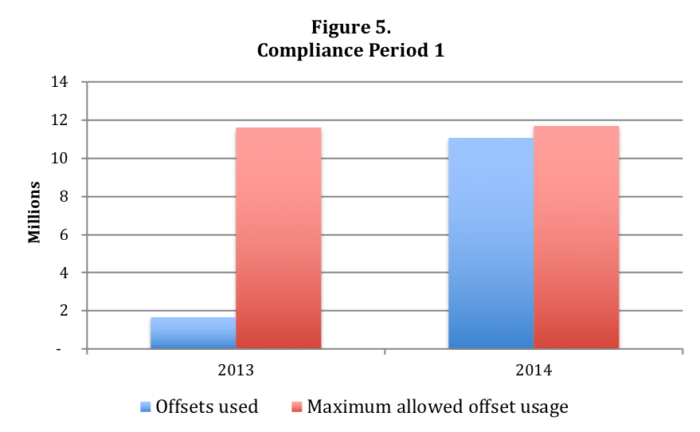 The end of Compliance Period 1 saw a large increase in the amount of CCOs surrendered for compliance compared to 2013 (Figure 5). With many companies choosing not to use their maximum CCO quota in 2016, there remains a substantial gap between the overall maximum offset quota, and those being surrendered. Therefore it’s possible that, as at the end of Compliance Period 1, there may be an increase in CCO demand. Naturally, the uptake of offsets depends on market supply and the comparative price and availability of CCAs. 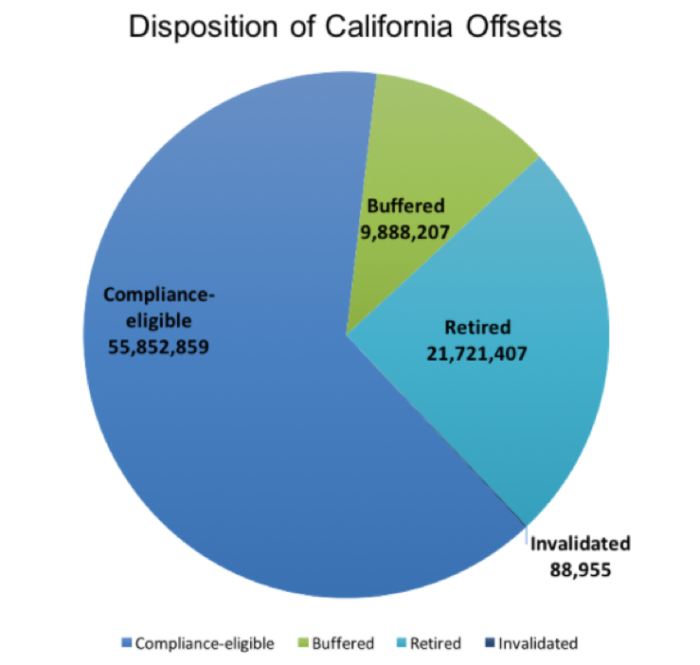 If every company chooses to surrender their full 8% CCO quota for Compliance Period 2, a further 62,884,654 offsets will be required in November 2018 (Figure 7). With 55,852,859 compliance-eligible CCOs currently in circulation (as of 31st Dec 2017), this maximum demand would not be met (Figure 8). Having said that, currently, only 5% of companies are utilizing their full quota, so it’s unlikely that demand will near 62 million. Furthermore, the supply is likely to be boosted over the next couple of months, due to the expected issuance of CCOs owing to several large forestry projects. CaliforniaCarbon.info is operated by Climate Connect Ltd, an online media firm established in London in 2010. With headquarters in London and in New Delhi, Climate Connect’s dedicated editorial, research, forecasting, and IT solutions desks have a global reach that allows us to serve clients in four continents. Climate Connect’s distinguished board of advisors consists of high net-worth individuals in the Bay Area and in New Hampshire, who boast 40 years of cumulative experience in the climate change markets. Climate Connect also operates several other websites, including www.chinacarbon.net.cn, www.cleantechdeals.com and www.energyportal.in. While Climate Connect, its data or content providers, the financial exchanges and each of their affiliates and business partners display information on the web site in good faith, no representation or warranty is given or shall be deemed given or implied by Climate Connect, its data or content providers, the financial exchanges and each of their affiliates and business partners to you or any other person as to the completeness, accuracy, sufficiency, currency, reliability or suitability of any such information, all which information is provided on an ‘as is’ basis, and all such representations warranties or conditions that may be implied by statute, general law or otherwise (whether as to title, non-infringement, merchantability, fitness for purpose or otherwise) are hereby excluded. Access full disclaimer statement.